Building a new business is exciting, but there are important things to consider as you form the founding team, whether with friends, existing business partners, or a significant other. Here I share some tips based on experience creating AccelerEyes. Personal: work with a responsible person you like and share values with. Equity: split equally, earn it out, and maximize value for all. Competencies: think what is needed and what you can get better at. Scenarios: plan for inevitable contingencies and fights. Your worst enemy: pre-emptively and explicitly plan for the worst. Is this someone you like working with? Can you see yourself working together at 3 am under a deadline? Do they annoy you? These are probably some of the most important questions that will determine your happiness. While having an annoying partner is not a deal breaker, the baseline aggravation can trigger bigger issues later. Is this person responsible? Is this someone you trust to work hard and get the job done? The nature of forming a partnership is because you need to spread work out, so you need to be able to trust that your partner will execute on their fair share. Do you share the same sense of values? Do you question their judgment? Have you witnessed or heard about them doing anything ethically questionable? If so, be blunt and ask them about it. Better to air the matter now rather than after you’ve formed a joint bank account. It’s been said that business partnerships are like a marriage without the benefits. You will be very close to your partners - as close as family. Choose your associates wisely. Equal split is best, unless you have a strong reason otherwise. Anything other than equal will create a subtle imbalance. The minor partners will feel less responsibility and show less initiative. Some days you’ll be the slug, and on those days you want to know that your partners are picking up the slack. Even if one partner clearly brings more to the venture, think long and hard about tipping this balance. You never know what the future holds, and likely you’ll all end up growing in your rolls. Instead of creating an imbalance from the start, look at the core competences and areas of the business and come up with a rough split that allows the would-be minor members to grow. When to consider unequal splits. There are good reasons to consider an unequal split. One partner might bring significant industry and operational experience, financial resources and capitalization, or simply putting more time into the project. Earn out. Avoid granting all equity up front. Instead, equity should be granted over years (4-5 years is common because it typically takes about that long to prove out a venture). I’ve seen companies trapped in an equity arrangement with a partner who abandons the project while keeping the original equity locked; these typically end in a dissolution of assets and re-incorporation. What a waste of time and energy. Bake in an agreement that rewards partners for sticking around, leaves open the option for fairly compensating partners that decide to walk away, and protects the corporation through all of this. Equity alternatives. Maybe you want to avoid equity altogether. One option is for the minor partner to be paid hourly while the major partner retains equity. If things are pre-revenue, maybe the minor partner could be guaranteed hourly pay from the first profits that roll in. Maybe the minor partner could “earn” equity over time. Maximize value for all partners. Whatever you do, the goal is to ensure that all partners can contribute as much as possible to the venture while feeling fairly compensated for those efforts. What core competencies are needed for the venture? Make a list. Who brings what? Who’s responsible for what? Think through the entire pipeline of your business, from sales and marketing to back end production and operations. Also consider ancillary tasks such as taxes and pay roll. What do you need to get better at? 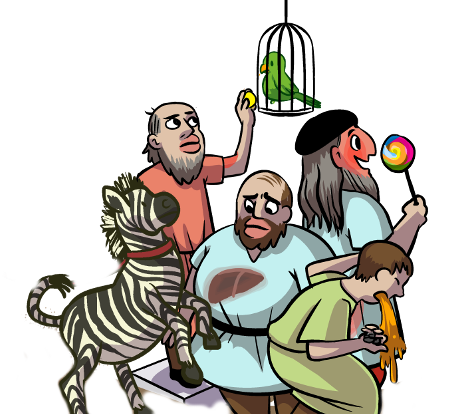 Some things you stink at, can’t (yet) outsource, or will need to learn yourself. Make a plan for how that will happen. 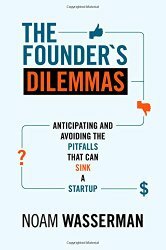 "Founder Dilemmas" is a collection of stories and lessons about when things go wrong, should you go it alone, or when to bring in cofounders, hires, and investors to help build a business. What happens if one partner walks? Who gets what? What if it’s after one year, two, or four? Consider specific scenarios if you can: if you’re both in school, what happens after graduation? What if you stay and the other partner leaves for a big fancy job? What about continuing work remotely? What if you are both balancing school or a job? What level of involvement is required to remain a partner? How and when will you evaluate? What’s the process for pushing a partner out? What happens when we don’t agree? Do you have a respected mentor or arbiter? Disagreements and fights are inevitable, so start a conversation early about how you’d like to handle when the inevitable happens. A few gentle, proactive discussions can significantly reduce the pain if things go off the rails. John Melonakos, my co-founder at ArrayFire/AccelerEyes writes about our some of early experiences in “Respecting our student commitments”, “Founder Vesting”, and “Cofounder Relationship Struggles Are The Most Volatile”. what if this partner was your worst enemy? how would you split up assets if you needed to divorce? what about assets you brought to capitalize the business? how would profits be disbursed? if you left early, how can you get your money back? if you caught them cheating, how would you deal with it? Don’t just gloss over holes in the contract and assume you both understand what it means. Make things explicit where you can.